When it comes to the quality of a renovation, a well-designed kitchen is instrumental, and the appliances we select to go with it are just as important. This is not only for the longevity of the joinery but our enjoyment and health too! This post is accompanied by more yummy recipes from Organic Soul Food. Scroll for Bette’s delicious Mighty Rainbow Bowl. Instead of treating appliances as building inventory, start the thought process centred on lifestyle goals. Premium and specialty appliances aren’t exclusively reserved for those serious about their flame, grill ‘n’ bake game - they can inspire all of us to create better, healthier lives. The average person will purchase a suite of appliances once or twice in their lifetime, so why not get it right? Think about your health goals over the next ten years, the food you want to share, and the people you want to share it with. The appliances you choose will influence these outcomes. The next thing to consider is their role in the design process. A confident appliance list early on allows us to invest our attention on refining usability. Cantilever’s approach to ‘making good kitchens’ is design-led, with customisation for client appliance selection a standard within our service model. This adaptability was essential to Bette (a seasoned cook and advocate of healthy organic living) achieving her culinary K2 Kitchen. We caught up with her to reflect on the process and importance of getting hands-on when it comes to high performance. As a workspace, Bette’s kitchen is a master’s domain: the details disciplined; stations ordered; appliances regimented. For a full walk-through of this commercial-inspired K2 kitchen check out our first segment. One of those was with Gaggenau. For the central bench, she squared in on a quartet of cooktops from the Gaggenau Vario 200 range. 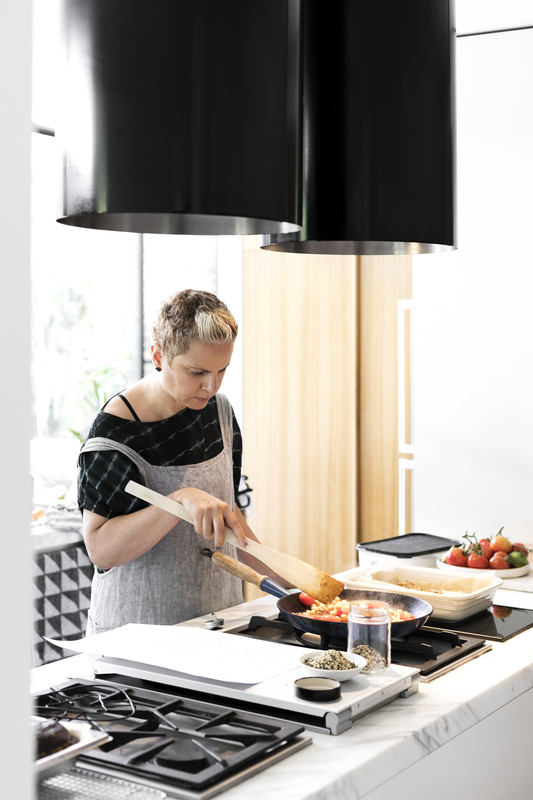 Tailored for the serious home chef, the series is offered as a selection of modular, compact and specialised applications for one to curate the ultimate personal workstation. Overhead two cylindrical Qasair rangehoods impress upon the room. Manufactured locally in Melbourne, this staple Australian brand is trusted for powerful performance with low noise. The experience of how something looks, feels and performs is called ‘Joy of Use’ – Bette’s kitchen is exactly that. Enriched by her passion for healthy living, her thoughtful approach beckons us to think a little wisely about the technology we engage with and bring into our home. 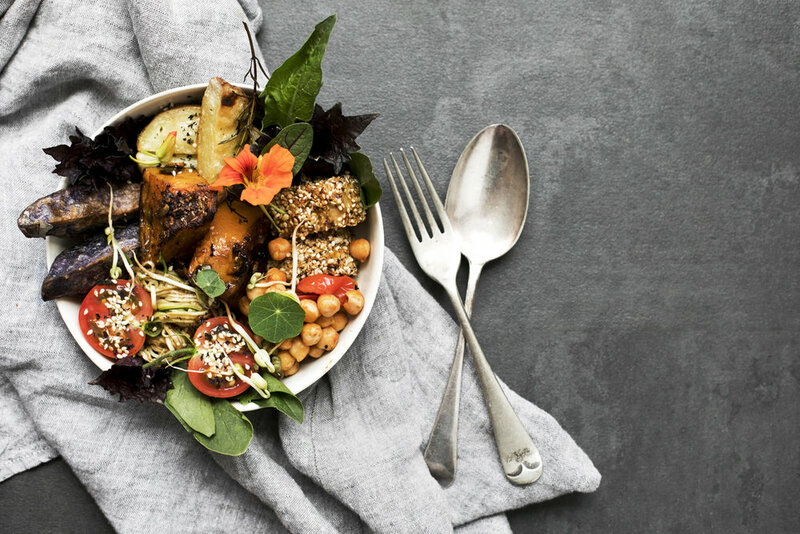 The Might Rainbow Bowl is the ‘United Nations of Food’. Taking on flavours from across the globe, this dish is not from one particular culture and has no set of rules. For this segment we’ll focus on the first three: an Asian inspired zuchini noodle dish, crumbed tofu and wedges. This dish is a series of ‘elements’ that can easily work as independent dishes this recipe offers itself as the perfect main or side to a healthy meal. Try them out as a snack or addition to your next meal and stay tuned for the final instalment with Bette. With a mandolin slice raw zucchini into ribbons and place into a bowl. Prepare the Asian inspired dressing with ingredients to taste. Set aside and dress before serving. This dish can be prepared early and stored in the fridge when ready for cooking. 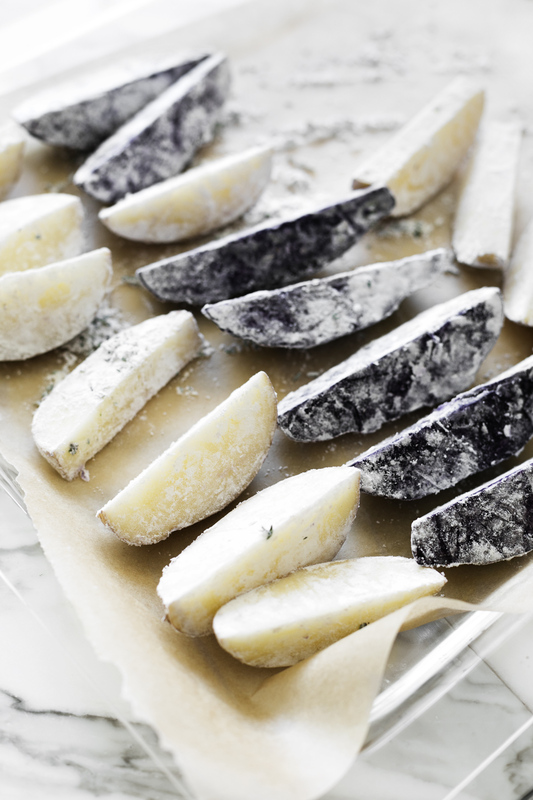 To start, make sure potatoes are truly washed, then dried thoroughly. Cut and dry again. Then cut into wedges. Flour the wedges in a bowl with Cajun spice mix, add oregano, garlic and salt to taste. Place in oven at 200 degrees. A glass tray is excellent for crisping things beautifully. Ensure they are spaced well and not squished. Add salt. Drizzle lightly with oil. Cook until crispy. If tofu is not your thing, this mix is perfect on mushrooms, carrots and meats. 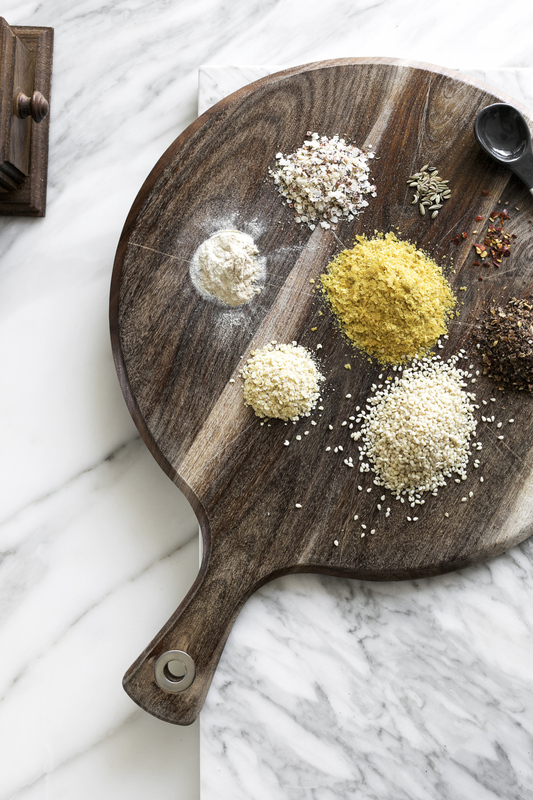 You can prepare a batch of spice mix to have readily available in the kitchen. Combine all dry ingredients into a bowl to taste. Drain chickpea juice liquid into a separate bowl. Set aside chickpeas. Place tofu on a tray with baking paper. Cook in oven at 180 degrees for around 30 minutes. 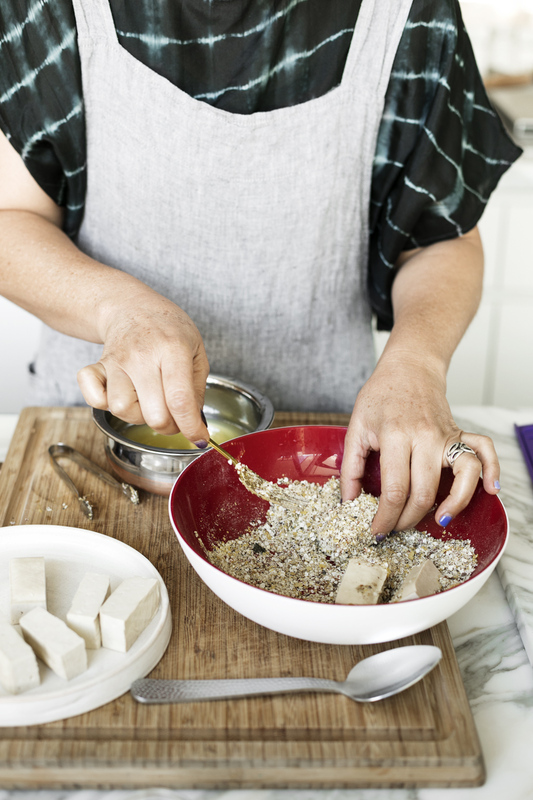 Bette Poulakos makes delicious, wholesome recipes for a living.